Patrick Healy was one of the successful Healy siblings of the early 19th century who openly acknowledged being of part African or black ancestry. Known as the first American of acknowledged African descent to earn a doctorate, Patrick Healy was also the first African American to become a Jesuit priest and the first to become president of a major university in the United States. Patrick Healy was born on February 2, 1834 in Macon, Georgia to an Irish American father and a mother who was a mulatto domestic slave. These loving parents wanted their children to receive a good education, which they could not receive in their home state due to laws restricting illegitimate children and slaves by birth from attending school. They were sent north to a Quaker school to be educated. Patrick Healy and his two brothers, James and Sherwood, eventually enrolled at the College of the Holy Cross in Worcester, Massachusetts. Here the brothers would follow their Catholic faith and later join the priesthood. 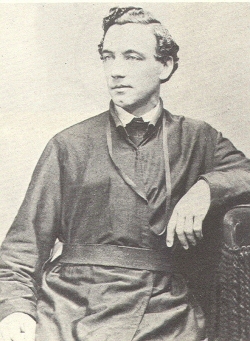 In 1850, Patrick Healy graduated and entered a Jesuit order. He was sent to Europe to study in 1858. Healy attended the University of Louvain in Belgium and earned his doctorate. At the same time, he was ordained to the priesthood on September 3, 1866. After he returned to the United States, Healy taught philosophy at Georgetown University. Eight years later, in 1874, Patrick Healy became the school’s 29th president. Patrick Healy instituted a number of significant changes at Georgetown during his presidency and is thus often referred to as the school’s second founder. His efforts initiated the transformation of the small 19th century college into a major 20th century university. His requirements for science, including chemistry and physics, helped to modernize the curriculum. He also expanded and upgraded the schools of law and medicine. But his most noteworthy accomplishment was overseeing the four year construction of one of the major campus buildings. It was first used in 1881 and would later be named in his honor as Healy Hall. In 1882, Patrick Healy left the college and spent his later years traveling extensively throughout the United States and Europe with his brother James, the first black bishop in the American Catholic Church. In 1908, Healy returned to the Georgetown campus infirmary where he died on January 10, 1910. He is buried in the University’s Jesuit cemetery. Albert S. Foley, Bishop Healy: Beloved Outcaste: The Story of a Great Priest Whose Life has Become a Legend (New York: Strauss and Young, 1954); God’s Men of Color: The Colored Catholic Priests of the United States, 1854-1954 (New York: Strauss and Young, 1955); http://www.library.georgetown.edu/.